Our hobby is full of entrepreneurs, collectively known as the cottage industry. Usually they’re hobbyists like you and me who have a good idea and the gumption to invest the time and money required to bring it to market. While it’s easy to create a business but a challenge to make it successful. We’ve seen a number of hobbyists create promising little enterprises only to watch them fizzle, usually with great disappointment from those who were eager to buy their products. An intelligent entrepreneur knows when to pursue a partnership. One person has a great idea and the other has the means to market it. That’s just what happened when Aaron Rhodes photographed the helicopters of the 4th Battalion of the 160th Special Operations Aviation Regiment (SOAR) at Ft. Lewis, Washington with the intention of assembling a CD of walkaround photos of the unit's aircraft. He started a conversation about the idea in a discussion on the Aircraft Resource Center, where it was well received by fellow enthusiasts. The discussion caught the attention of Floyd Werner, proprietor of Werner’s Wings, a cottage industry company that specializes in rotor wing conversions and accessories. “Aaron's pictures were awesome,” he said. 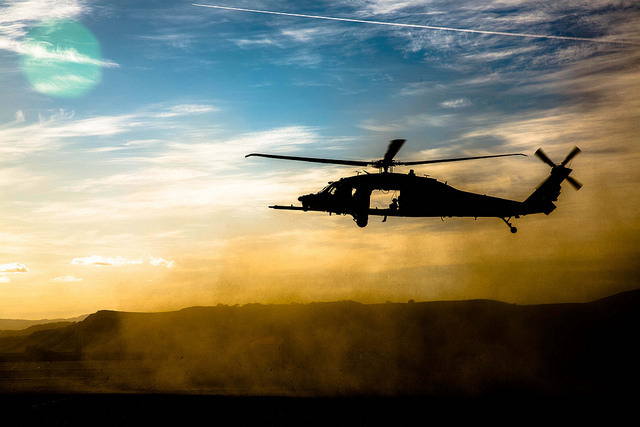 "He wanted to put together a CD, but the battalion flies only the MH-47G and the MH-60M.” Floyd's friend Aaron Drake stepped in with an offer to expand the coverage of the CD to include other aircraft operated by the 160th — the AH-6M, MH-6M, and the MH-60 DAP — at Ft. Campbell, Kentucky. That partnership became the key what is shaping up to be a successful product, which is now bigger and better than first envisioned. Aaron knew the limits of his interest in the project, realizing he didn’t want to manage the distribution of a CD, which would consume a great deal of time. Werner's Wings is a known presence in the hobby. Why not work together? With a plan now in place, Floyd caught up with Aaron Drake at Ft. Campbell where they shot more than 2,000 photos walkaround photos of the aircraft there. "We were granted access to all the aircraft. They were even nice enough to set them up as they would be for a downrange mission,” Aaron said. Their access to the Night Stalkers was unprecedented. “They allowed us to shoot just about anything we wanted. The only thing they didn’t want us to shoot was the instrument panels," though edited photos may be available, with sensitive areas obscured. Anyone remember the F-4G photos in Detail & Scale's book back in the 1980s? With so many high quality photos Floyd is considering publishing a book rather than the CD. And the team is not done yet. Floyd is planning a visit the 3rd Battalion in Savannah, GA to photograph their aircraft. "Each unit configures their aircraft differently as per their geographic location,” he told me. And if that’s not enough, Aaron Rhodes has a photo shoot in August with the 4th Battalion. Adding those two battalions to the CD (or book) will provide complete coverage of the 160th’s aircraft for modelers interested in these unique aircraft. Editor’s note: Major Worrell was killed during during combat operations in 2006 in Yusifiyah, Iraq and posthumously awarded the Purple Heart and Silver Star. Floyd and the two Aarons are going to donate $5 of each DVD sold to the Night Stalker Association and an additional $5 donation to the Special Forces Association. Keep an eye on the Werner’s Wings web site and follow them on Facebook for an announcement when the CD or book is ready. In the meantime be sure to stop by their table at the IPMS National Convention later this month. I did some damage at their set up at Nats. Such great stuff. Their website does not do it justice.